Are you looking at your rusty surfaces feeling stumped? Or maybe you’ve just not been able to get round to it. Well, you don’t have to struggle any longer. It is possible to give rust a complete makeover turning it around. It’s simple to paint over it without having to spend a long time trying to manually remove it. If you’re preparing your metal surface for painting – let’s make it simple and quick for you. All you need to do is grab a wire brush, a scraper and some cleaner/degreaser. Remove grease, oil and other surface contaminants by cleaning with appropriate detergents (something like Rust-Oleum Mathys ND14 Cleaner Degreaser is ideal). Then remove rust scale, loose mill scale, loose rust and loose coatings by scraping, wire brushing and sanding. This will leave you with a smoother surface to paint over and helps to ensure adhesion, don’t worry though you don’t have to remove ALL the rust! Finally, sand any previous coatings which are in good condition to roughen the surface slightly. After all the above, make sure you thoroughly clean the surface down and it should be preferably dry during application. Now we’re sure you want to paint over that unsightly rust. 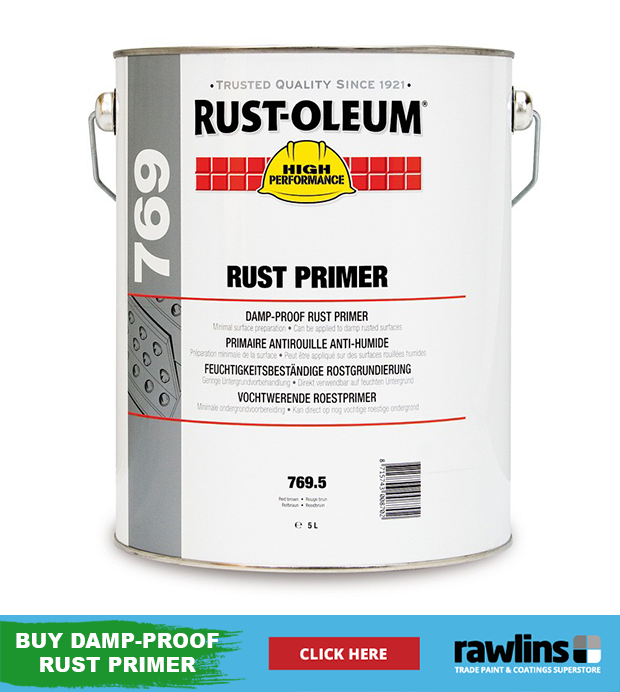 Use Rust-Oleum 769 Damp-Proof Primer as it needs minimal preparation, and penetrates the rust all the way to the metal! You can apply it on slightly moist or dry surfaces, for durable corrosion protection. It works by expelling moisture and air, and encases the rust whether you use it with, or without a top coat! 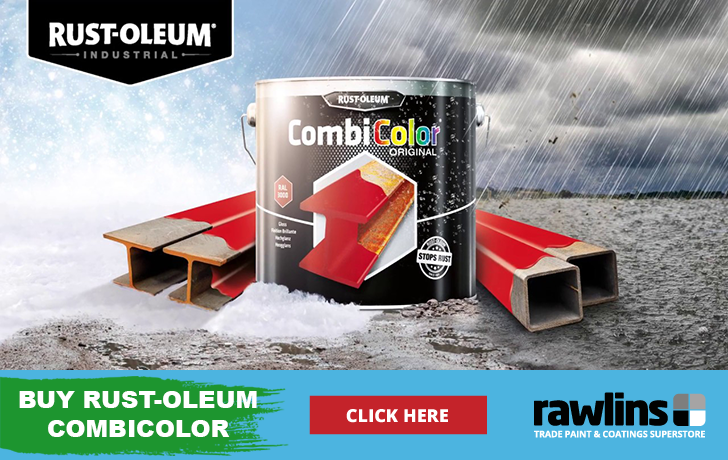 Rust-Oleum 769 Damp-Proof Primer is based on a unique, low-odour formula based on fish oil. It’s the wonder primer that started it all for Scottish-born sea captain Robert Fergusson when he noticed that the rusty deck of his vessel stopped corroding in places where fish oil had been spilled. This discovery inspired the captain to develop the first fish oil-based anti-corrosion paint. In 1921 he perfected a type of paint that prevented rust and was capable of drying overnight without leaving any unpleasant odours, Rust-Oleum® Corporation was born. Once you’ve used the damp-proof primer, you’ve got the opportunity to redecorate and be creative! 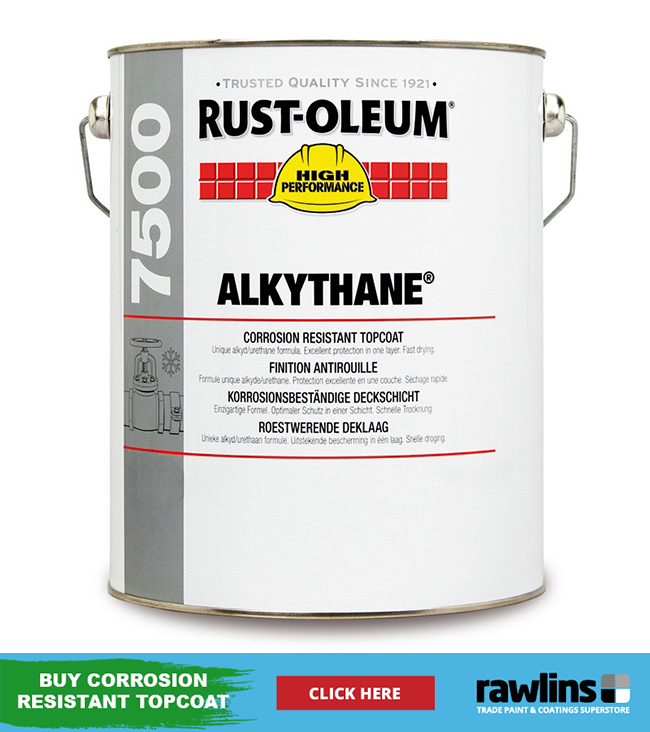 You can paint over the newly prepared rusty metal with any colour scheme you like using Rust-Oleum 7500 Alkythane. 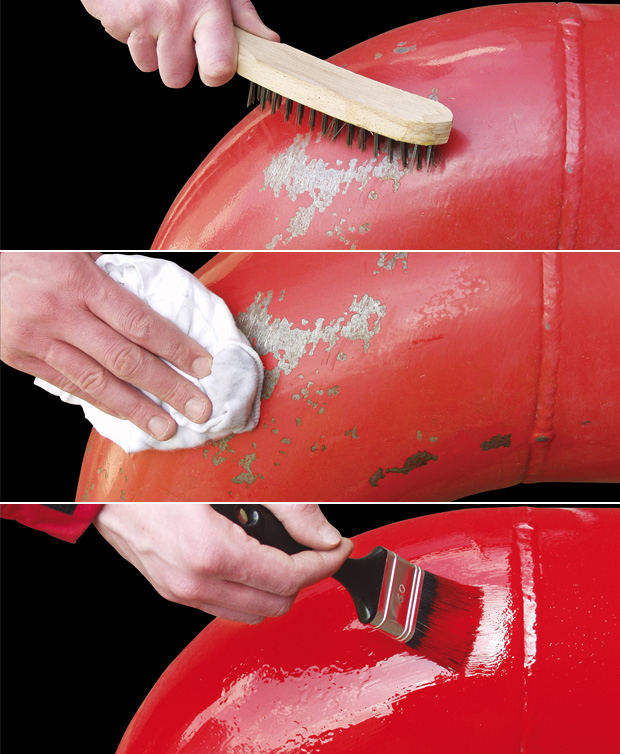 By using the damp-proof primer you’ve skipped the manual rust removal process, saving you time! If you’ve got a rusty old staircase, why not give it a re-vamp and paint it with bright, exciting colours! You could even use hanging baskets and flowers for a quirky, colourful look. Metal cladding not looking too great? Just paint over it with the damp-proof primer and choose a strong colour to bring it back to life. Whether you stick to a plain finish, or something bold, you’ll be able to hide the rust underneath and protect the surface with Rust-Oleum 769 Damp-Proof Primer. If you’re struggling with your rust-revamp, just contact the friendly team at Rawlins Paints! Do you have an etching primer plus follow-up paints for a galvanised garage door from which the paint is flaking? Yes. Remove as much loose and flaking paint as possible, any remaining, soundly adhered paint should be sanded to provide a key and then thoroughly clean the entire area. On the areas that are back to bare galvanised metal, prime first with Rust-Oleum 3302 CombiPrimer Adhesion, after 45mins apply 1 coat of Rust-Oleum CombiColor in your chosen colour and finish to the full door surface (including over existing well adhered paint). Allow to dry for 16 hours @ 20°C, and then apply a second and final coat of Rust-Oleum CombiColor to finish to system. Thanks for sharing this. My parents door got really rusted, we then decided to get a new one for me because rust covered the entire door and painting it wouldn’t work. That is the end. Rust is painful and sometimes a sign that you need to get a new one.